My interest in the study of organisations, its people, systems, strategies and practices has induced an interest in the writings of Jim Collins, who has written extensively on different aspects of organisations, their journey, survival and the causes what makes them great as well as what makes them fail. In that series after having gone through Built to Last and Good to Great I picked up this title in order to understand the reasons why do organizations fail. 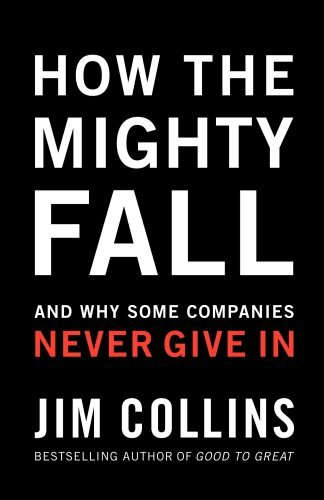 Jim Collins remarkably develops an argument for the causes of failures of big organizations through the writings, data, interviews profiling performances on different parameters. The organizations like Bank of America, Zenith, A&P, HP, Motorola, Rubbermaid, Scott paper, Fannie Mae, Merck, Xerox, Circuit City, IBM etc. have been studied and the change led through their leadership and its impact on organizational performance has been narrated through many examples and on the basis of this certain conclusions are drawn as to the common elements in their strategies, policies, practices which resulted in their momentary or long-term failure. The research culminates into providing five stages of decline as Stage 1 - Hubris Born of Success, Stage 2 - Undisciplined Pursuit of More, Stage 3 - Denial of Risk and Peril, Stage 4 - Grasping for Salvation, and Stage 5 - Capitulation to Irrelevance or Death. We grew up studying different life cycles of products and organisations. This life cycle warns the organizations at different level of its long term effect, if they do not change or adapt to new practices at organizational level. These stages are elaborated in different chapters through the organizational behaviour and practices, big companies reflected on. The lessons learnt could be related to individuals as well, since it is the individuals who develop systems, structures and strategies in an organizational set up. It is the individuals who form, develop and nurture organizations through developing an orgnaizational value system and compelling cultures which the successors follow. The basic fabric of an organization is woven through the value systems of individuals which is reflected through the policies and procedures followed in organizations. It is in this context this book makes a strong case for bringing out causes which warn organizations so that the learning could be used to never fall trap to those circumstances. After becoming a giant corporation, its leaders tend to develop a sense of arrogance (stage 1), that it can do anything (stage 2), since it has brand, power, presence and performance to back it up. Initially it does provide some warning signals but the arrogance avoids such signals and develops a kind of belief that it is momentary (stage 3) and it can recover the fall in the long run. Non responsiveness of the leadership to the initial signals of fall, further deteriorates the performance (stage 4) and it enters into a situation where it can never improve (stage 5). Bad decisions made with good intentions are still bad decisions (p 148). This journey of mighty corporations make them irrelevant and forces them to die their own death. The book is divided in 8 chapters of which 5 chapters are devoted to each stage. The last chapter is entitled Well-Founded Hope, which provides the ways how organisations can avoid and respond back through positive attitude and never-say-die approach. The role of leadership is said to be very crucial at this stage and great leaders are always on toes for change. Jim provides a defense for his recovery mechanism through the practices at Xerox, Nucor, IBM, Texas Instruments, Pitney Bowes, Nordstrom, Disney, Boeing, HP, Merck. What do these companies have in common? Every one took at least one tremendous fall at some point in its history and recovered. Sometimes the tumble came early, when they were small and vulnerable, and sometimes the tumble came when they were large, established enterprises. (p 116) The example of Churchill's return is also well cited. People make organizations and their systems. Their value system, their capability to take risk, their enterprising behaviour, their leading ability, their determination towards fixing and achieving audacious goals affects organisational decision making and practices. If we discovered that organizational decline is a function first and foremost of forces out of our control - and if we discovered that those who fall will inevitably keep falling to their doom - we could rightly indulge in despair. But that is not our conclusion from the analysis, not if you catch decline in Stages 1, 2, or 3. And in some cases, you might even be able to reverse course once in Stage 4, as long as you still have enough resources to get out of the cycle of grasping and rebuild one step at a time. Towards the end there are 7 appendices detailing the selection criteria for different companies, their decline and recovery mechanisms. What caught my eye was Appendix 5 - "What Makes for the 'Right People' in Key Seats?" This is quite apt and fits into organizational set up for putting right people for right job. According to him right people fit with core values of the company, they are passionate about the company and its work, they fulfill their commitments, they don't need to be tightly managed, for them responsibilities are more important than just job, and they display 'window and mirror' maturity. This work is compared with Level 5 leadership as explained in Good to Great in Appendix 7, looking at different stages of decline and leadership role. Never give in. Be willing to change tactics, but never give up your core purpose. Be willing to kill failed business ideas, even to shutter big operations you've been in for a long time, but never give up on the idea of building a great company. Be willing to evolve into an entirely different portfolio of activities, even to the point of zero overlap with what you do today, but never give up on the principles that define your culture. Be wiling to embrace the inevitability of creative destruction, but never give up on the discipline to create your own future. Be willing to embrace loss, to endure pain, to temporarily lose freedoms, but never give up faith in the ability to prevail. Be willing to form alliances with formal adversaries, to accept necessary compromise, but never - ever - give up on your core value. This is a must read for those who are interested in the study of leadership, organisations and their transformations and I am sure apart from just learning different stages of decline, one would also learn lessons for self-development.